In recent times the Kingdom of Cambodia has arisen from the ashes of war and internal strife, and its monumental treasures are again on show to travellers. The incredible temple complex near Siem Reap has astounded archaeologists since its re-discovery and subsequent recovery from the jungles, 150 years ago. The famous Angkor Wat is but one of many glorious monuments in that area. The reconstructed capital, Phnom Penh, still contains vestiges of the French colonial era in its historic architecture. and standing in the jungle. Breakfast at hotel then transfer to Siem Reap by morning flight (FT992 @ 0930-1020). On arrival met and transfer direct to hotel for check in. Visit the antique capital of Angkor Thom (12 century): the South Gate with its huge statues depicting the churning of the ocean of milk, the Bayon Temple, unique for its 54 towers decorated with over 200 smiling faces of Avolokitesvara, the Phimeanakas, the Royal Enclosure, the Elephants Terrace and the Terrace of the Leper King. We go for lunch at local restaurant. 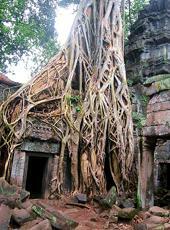 Morning visit Ta Prohm, one of the area’s most beautiful temples. Neak Pean, a fountain built in the middle of a pool (representing the paradisaical Himalayan mountain-lake), Ta Som, built in late 12th century C.E. the most distant temple on the grand circuit, small but classic. Preah Khan temple, built by the King Jayavarman VII. Free at leisure until transfer to Siem Reap Airport for flight home. End of services by Indochina Travel Service.